Hopefully, by now every company that uses the inventory module in Dynamics 365 Business Central (aka Dynamics NAV) knows that they MUST run the Adjust Cost – Item Entries process. While asking companies to run the adjust cost process, some people will report that they experience unwanted entries made to the previous accounting periods. Why? The reason is because the adjust cost process will always adjust to the date of the original sales transaction (unless specified otherwise). For example, it’s 6/30/18 and you run the adjust cost process. If you haven’t run this process in a while, and there was a sales transaction that occurred in 3/15/18 that has not been adjusted yet, the resulting adjusting entry will be on 3/15/18. This will cause problems if you’ve already closed the books for March. This is where the Allow Posting From field from the General Ledger Setup screen comes to the rescue. 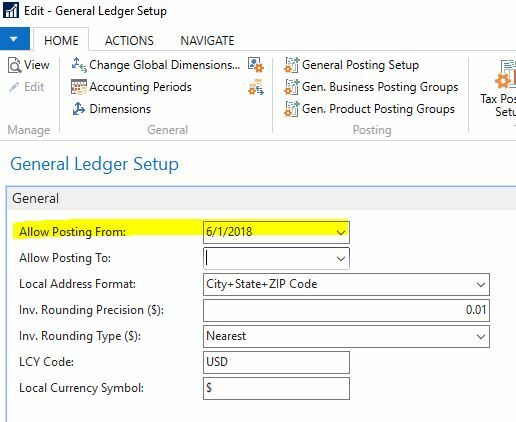 If you set the Allow Posting From on the General Ledger Setup, any adjust entries that are BEFORE the Allow Posting From date will have same posting date as the Allow Posting From field. In our example above, it’s 6/30/18 and you run the adjust cost process. In addition, you set the Allow Posting From to 6/1/18. If there was a sales transaction that occurred in 3/15/18 that has not been adjusted yet, the resulting adjusting entry will be posted on 6/1/18. Setting the Allow Posting From should be done after you close the month out, NOT before. I’ve seen situations where the user changed the Allow Posting From BEFORE the adjust cost was ran. So all of the adjusting entries were posted in the current period instead of the period that they should’ve been in. Just little things to help make your life (hopefully) easier. As a Dynamics NAV Microsoft Certified Trainer I am very surprised that I rarely do the training Class Inventory Costing, because this is so essential that you understand the process of how the value of your Inventory i Calculated. To my experience since 1984 with NAV, inventory value is causing troubles for 7 out of 10 customers because Microsoft partners don’t fully understand how it works. Negative inventory is also an important issues, and perhaps if you have time you should give an example of that together with the beauty of using Inventory Periods. Inventory Periods can save you a lot of time. One solution is to use “Inventory Periods”. Define periods for at least every month. And do close the periods at least monthly. You are not allowed to close an Inventory Period inless you are copmpletely up to date with your inventory-adjustments. Try Inventory Periods. Does not cost anything but a little time. If you can’t use, no harm done. Not sure if using inventory will completely solve this problem. Yes, it will prevent people from back dating, but it doesn’t control the resulting adjust cost process on which posting date it should use. Good idea! Inventory Period would be a good follow up topic! Thank you! No. By doing this, you will have issues with adjust cost if you don’t have it run automatically by day.